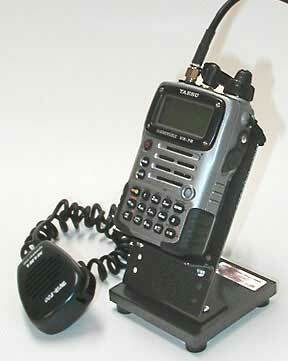 Convenient desk-top holder for all hand-held radios. Get double duty out of your HT, add an external microphone and use it as a Base Station as well as a portable. The HT Stand holds your radio upright and steady at a comfortable viewing angle. Stops a remotely connected antenna or external microphone from 'dragging' your HT around on the desk. With its adjustable shelf, the HT stand fits just about any HT with a 'belt clip'. Radio clips to the support plate with the radio's 'belt clip'. Stand may not be suitable for radios without 'belt clips'. The main support and shelf are made of durable polycarbonate material with the base being made of steel. 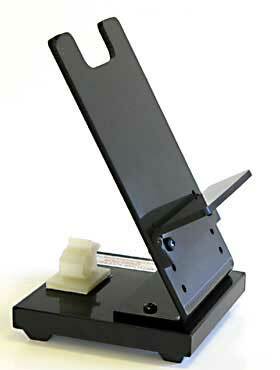 The heavy steel base, which rests on soft rubber feet, provides your radio with stable solid support. Our HT stand sports a gloss-black finish with the main support plate and shelf being made of an extremely tough 1/8 inch polycarbonate material, very similar to Lexan, a hi-tech material often used for making helmets, aircraft windshields and shatter-proof glass. The solid steel base is painted / powder coated with a matching gloss-black finish. We use the oven-cured powder coat process because it yields a very tough finish, better than ordinary paint. A high-quality product that looks great on your desktop, a handsome companion to any HT. 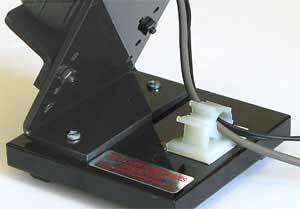 The stand includes a cable clamp for restraining antenna, power supply and microphone cables. Cable clamp is easily opened to insert wires and ratchets closed to restrain wires attached to the HT. Pressing a lever reopens the clamp at any time. Our adjustable HT stand will fit any radio that is 4.15 inches or less in height from the bottom of the radio to the bottom side of the 'belt clip' fastening point, as shown in the diagram to the left. Several customers have e-mailed us about other things they are doing with the HT stand. *** Some are using them to hold their cell phones and scanners. *** N2IO is using one to support the detachable front face of his mobile radio. He mounted the front panel using double-sided tape to mount the bracket to the stand. A neat space saving idea, the main body of the radio is then off his desk. *** KD4AR drilled a hole in the shelf and added some Velcro and uses it to hold his KX-1. *** Cal Barton wrote to say his daughter 'stole' his stand to use with her iPod and had to buy another stand. He says its a perfect fit for the iPod. 48 IN STOCK. Usually ships in 1 - 2 business days. Press the Add to Cart button below to purchase.